AAS: All-American Selections – new varieties which are annually voted to be most superior. Beefsteak: a term used to classify tomatoes that centers on the size and shape of the fruit. Beefsteaks are the largest type of tomato. Some beefsteak tomatoes weigh one pound or more. Beefsteak tomatoes are popular among home gardeners, particularly for making sandwiches, but are not often grown commercially because of the difficulty of processing. Blight: two diseases (early blight and late blight) that attack tomatoes and affect the leaves, stems, and fruit. Cherry tomato: a term used to classify tomatoes that centers on the size and shape of the fruit. Cherry tomatoes are the smallest type of tomato. They range in size from a thumb tip to the size of a golfball. Cotyledons: the first leaves to emerge from the tomato seed. Crack resistant: a characteristic of a tomato variety that inherently resists breaks in its skin. Breaks are sometimes called “growth cracks.” Cracks are usually caused by inconsistent or excessive rain. Determinate: a term used to classify tomatoes that centers on the length of time the plant produces fruit during the season. Determinate tomatoes produce for a couple of weeks and then production fades out. When terminal buds set fruit, plant growth stops. Globe tomato: a term used to classify tomatoes that centers on the size and shape of the fruit. A globe tomato is uniformly round. It is sometimes called a “slicing” tomato. Globes are the most commercially cultivated tomatoes. Harden off: gradually acclimating tomato seedlings to outdoor temperatures, sunlight, and wind to prepare them to be set out in the garden. Created Heirlooms: two crossed varieties bred multiple times to eliminate undesirable characteristics and stabilize desired characteristics. 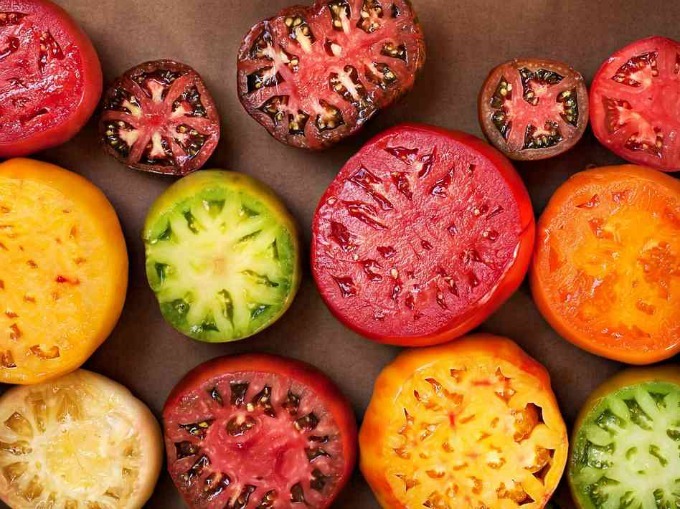 Mystery Heirlooms: varieties that are a product of natural cross-pollination with other heirloom varieties. Note: All heirloom varieties are open-pollinated but not all open-pollinated varieties are heirloom varieties. Hybrid tomatoes: tomato varieties that deliberately bred as a cross between two different varieties, most often to cultivate specific characteristics. Indeterminate: a term used to classify tomatoes that centers on the length of time the plant produces fruit during the season. Indeterminate tomatoes produce fruit throughout the season, often until frost. They never sets terminal flower clusters, but only lateral ones, and continue indefinitely to grow taller. Locules: small cavities or chambers within the tomato that hold the seeds within a jelly-like substance. Some tomatoes are bi-locular (2 chambers). Many are multi-locular (many chambers – as many as 10). Maturity: the number of days from transplanting seedling in the garden to its first mature fruit. Early season varieties mature in 55 to 68 days; midseason varieties in 69 to 79 days; late season varieties in 80 days or more. Oblate tomato: a slightly flattened tomato shape. Open-pollinated (OP): a tomato variety that has been pollinated by its own variety. All heirloom varieties are open-pollinated. Not all open-pollinated varieties are heirloom varieties. Plum tomato: a term used to classify tomatoes that centers on the size and shape of the fruit. Plum tomatoes are medium- to small-sized, oval or cylindrical in shape, are thick-walled, and have fewer seed compartments. Plum tomatoes are sometimes called paste tomatoes or Roma tomatoes. Pollination: the process in which pollen is transferred in tomato plants for fertilization. Pollen grains are released by a flower’s anther and fall to the stigma, usually within the same flower. Oxheart tomato: a type of heirloom tomato that’s large and heart-shaped. Potato-leaf: tomato plant foliage without indentations on the leaf margins. Foliage looks similar to the leaves of a potato plant. Regular-leaf: tomato plant foliage with indentations on the leaf margins. Semi-determinate: short-vined tomato plants. Semi-determinates continue to grow and produce longer than determinates, but plants don’t get as large as indeterminates. Slicing tomato: a term used to classify tomatoes that centers on the size and shape of the fruit. A slicing tomato is uniformly round. It is also called a “globe” tomato. They are the most commercially cultivated tomatoes. Widely-adapted: a tomato variety that easily adjusts to grow well in several different climatic zones. See more tomato fun and trivia on our Pinterest board. Take The Great Tomato Quiz!